To connect PDA and the logger together for all Navi-gation softwares. any PDA to any logger or GPS. Connection box powers both unit through the cables. There are special kits for two-seaters with 2A output and double PDA cables available. 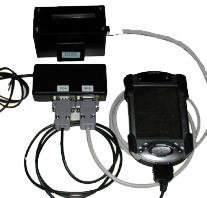 Pro kit is specially made to connect the Winpilot compatible variometer to PDA-logger-Winpilot Pro combination. The data control switch allows the direct communication with the logger. Easily removable solutions for powerplane pilots.